If you have not already looked at the overview article, you will want to do that before proceeding. TouchPoint has two types of Check-In: one for PCs and one for tablets. PCs with Touchscreens? iPads/Tablets? How Many? Check-In can be installed on any PC with Windows Operating System (8 or 10) and a touchscreen monitor. You can use an all-in-one with a touchscreen, such as Windows Pro, but not Windows RT. If you want to use tablets, we have mobile Check-In for iPads and for Android tablets (it will even work an Android phones). Decide how many Check-In stations you will need based on the number of people checking in at any given hour. TouchPoint Check-In allows entire families to check-in at the same time. At our home church, Bellevue, we have about 16 Check-In computers that are used on Sunday mornings. We use a number of locations, because the classes are spread out and families can enter through one of many doors. We check in between 1200-1500 children and workers each week. These are spread out over 3 different hours on Sunday mornings. So, we have about 400 at any given time slot. Two of our Check-In stations are in our Welcome Center in the main foyer and are used just for new guests. It takes a little longer to get all the information on a new family than it does for a regular attenders to check-in all their children, and do not want guests to feel rushed. That’s why we take new guests to a separate area. We have some pictures of various types of kiosk setups as examples for you. Check-In works using labels for security. You determine how many you want to print for each organization. We have special Guest labels as well. You may decide not to use labels for certain classes/age groups. That’s fine, too. What Brand of Printer? What Size Labels? TouchPoint Check-In will work with a number of printers. However, the only one we currently recommend is listed below. We also recommend using labels that are 2 x 3 inches, as they stay on better and will display multiple classes on one label. If you want to use 1-inch (height) labels, those cannot be purchased through Godex, although they will work with those printers. The labels themselves must be 1 x 3 inches with a 1-inch core. Based on your hardware decision, you will either download the PC version on the computers to be used for Check-In, or you will download the TouchPoint Check-In app onto the iPads/tablets you plan to use. If you are using iPads or Android tablets and plan to print labels, in addition to installing the TouchPoint Check-In app on the mobile devices, you must also download and install the normal PC Check-In software on the PC(s) you will be using for your printers. If you are using PCs with touchscreens, download and install Check-In directly onto every computer you will be using. Click the Install button, to download the software. If you do not have the minimum requirements of the .NET Framework, click the link to download the prerequisites (see image above). This could take about 20 minutes to download and install the .NET Framework. You will only need to do this one time on each computer. The Windows 10 Operating System will already have this installed. Enter the username and password for the user record you are using for your Check-In computers and log in. Users must have the user role Checkin . Whenever there is an update to the TouchPoint Check-In software, it will install automatically the next time you open the software after the update has been pushed out. This will only take a few seconds and will open the software automatically once it finishes. Therefore, please close the software after you finish using it each day. If you are going to use iPads or Android tablets for Check-In, go to the Apple App Store or Google Play and search for TouchPoint CheckIn . These apps are designed for tablets but will work fine on your Android phone or iPhone. If you are using our original iPad app named BVCheckin , please replace it with the new version named TouchPoint CheckIn from the App Store. Install as you would any other app. Logging in is similar to PC Check-In described above. 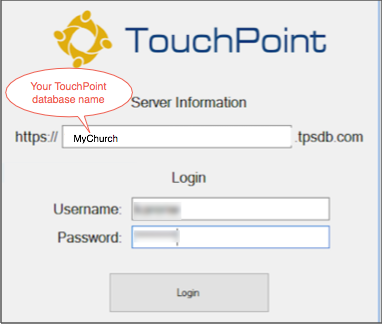 Enter only your church’s TouchPoint database name; the beginning and ending of the URL will already be displayed. Do you have phone numbers for families - either home or cell? Families check in by entering a phone number, so this is important. Are your families grouped together correctly? In other words, are children in the family with their parents? Do you have dates of birth for most of your members? Are your children enrolled in the correct classes? Are your teachers enrolled in the classes that they teach? You will need to edit some settings on the organizations you plan to use for Check-In.